Taiso Yoshitoshi (1839 - 1892) Picture of the Penance of the Priest Mongaku - Mongaku shonin aragyo no zu, 1885. Kakemono-e. There are some Japanese woodblock prints that are so outstanding in their design and execution and so rare to find in good condition that they occupy a special status amongst academics and collectors. This vertical diptych by Yoshitoshi is one such print. By any standards, the design of this print is breathtaking; I know of no precedent anywhere in eastern or western art for the truncated body of Mongaku rising from the spray of the waterfall at Nachi. The choice of the vertical diptych format for this subject is inspired, enabling Yoshitoshi to present an an aerial view of Mongaku whilst showing the distant goddess Kannon parallel to the viewer. The quality of the print is breathtaking; the surface is riven with embossed details, animating the crashing water, whilst the feet of the two deities are shaded almost to nothing - illustrating the rising mist. Behind the figures the hand-applied and shaded deep blue of the waterfall creates a striking background that emphasises the verticality of the composition and the vertiginous scene. The subject was a favourite among ukiyo-e artists, none though came close to Yoshitoshi’s example in originality or movement. The legend of this famous priest is told in the play, Nachi-no-Take Chikai no Mongaku, “The Priest Mongaku at the Waterfall of Nachi". Endo Morito, a samurai, became besotted by the beautiful wife of Watanbe Wataru. She rejected his persistent demands until one night when she agreed a rendezvous where Morito was to decapitate her husband. She put herself in his place and Morito, recognising his mistake took holy orders (changing his name to Mongaku) and spent three years enduring the harshest penance, eventually praying beneath the Nachi Falls in the freezing winter. At the point of death, he is rescued by Fudo Myo (the Buddhist deity of fire) and by Kannon, the goddess of compassion. Yoshitoshi chooses here the moment that Mongaku is expiring and he is lifted aloft. An excellent early edition, first state of this print. In the first state the title is printed at the bottom, the paper is thick and soft and there is extensive embossing. 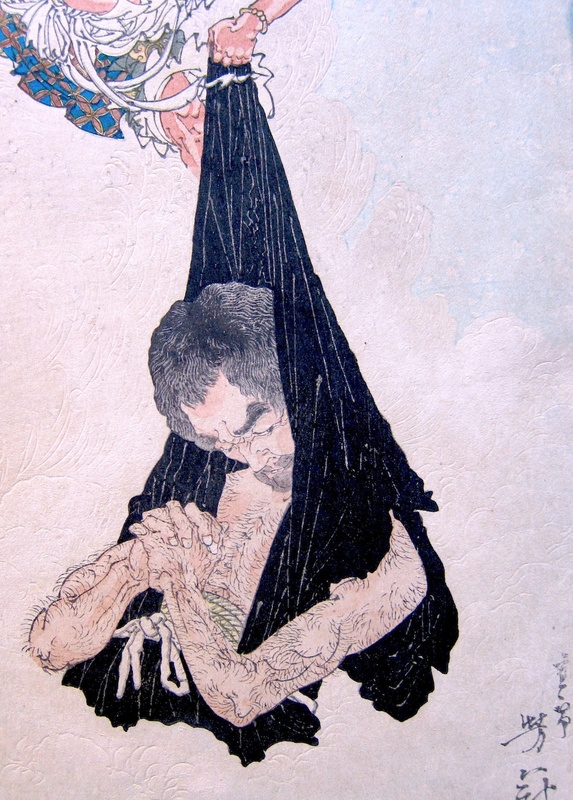 The diptych was republished in 1887 by Hasegawa Tsuenjiro. The original publisher, Matsui Eikichi was a pupil of Yoshitoshi’s. Unusually, this print is untrimmed. Very fine impression and colour. Very good condition, some minor surface marks, the two sheets are joined but there are no folds or creases. Signed oju Yoshitoshi ga, with Taiso seal. Published by Matsui Eikichi. This print is ilustrated on page 68 of van den Ing & Schaap, Beauty and Violence, Society for Japanese Arts 1992.